In March of 2012, I posted a bit about the process behind paleontology author and blogger Brian Switek's Allosaurus tattoo design, which he commissioned from me and had inked at the Heart of Gold Tattoo studio. Brian Switek is the author of Written in Stone and My Beloved Brontosaurus and the former blogger at Laelaps on Wired, and Dinosaur Tracking on the Smithsonian site. Recently, he's taken his Laelaps blog to National Geographic's new "science salon" blog network, Phenomena. You can read more about how I personalized it with hidden Easter Eggs in the design to make it specifically for Brian in the original post. Brian liked it enough, he needed another carnivore. Sketching the horned beastie in my Moleskine. Ceratosaurus was much like Allosaurus but with a wicked horn, and devilish ridges over its eyes. My work in progress, inking using ArtRage Studio Pro. The inks in ArtRage are pretty phenomenal. In this case, I mostly stuck with the technical pen. Illustrators out there can see why I enjoy Artrage so much. It's like working on a desktop in realspace. Reference photos pinned, all my tools on the quarter-wheel to the left, all my paints in the palette on the right. My first proposed final design. You can see one of the differences I made from the Allosaurus in the top image in this post: The allosaurus had hollow, outlined vertebrae and ribs, with solid black limbs and skull and the Ceratosaurus has the reverse. The dinosaurs are similar enough (and I was proud of my skull linework on the Cerato) that I thought this might be interesting. Brian made the call, and it was the right one to have both matching: outlined vertebrae and ribs, solid limbs and skull. The two predators are, after all, side-by-side on his arm and so the similarity strengthens the design. From left: Allosaurus, revised Ceratosaurus, initial Ceratosaurus. Click to enlarge. Yeah. The middle one matches the Allosaurus much better, and the skulls have more impact in solid black. Brian visited Jon at Heart of Gold tattoo in Utah again, and here's the final result! Brian's arm photo by Tracey Switek. It was amazing working with Brian Switek again and boy oh boy - I want a dino skeleton tattoo now myself. You can read more about how the two skeletons I largely worked from for the Allosaurus and Ceratosaurus are related over on Brian's post on the new Laelaps! If you'd like to see more of my science ink designs, check them out at my portfolio at glendonmellow.com under the science tattoo header! Written by Glendon Mellow On January 3, 2013 In "#scienceink", "ArtRage", "Moleskine", "ceratosaurus", "dinosaur", "tattoo"
I mentioned on Twitter I was drawing a two-headed mutant ammonite.
. @flyingtrilobite's tweet makes me wonder: are there any fossils of two-headed animals? @edyong209 If you believe in yourself, one day *you* might be a two-headed fossil, Ed. Make your own dreams come true. @edyong209 @flyingtrilobite SHUT UP AND TAKE MY MONEY. Written by Glendon Mellow On September 8, 2012 In "Ammonite", "Moleskine", "Twitter", "pencil", "science", "sketch"
Recent sketch in my Moleskine. Written by Glendon Mellow On May 15, 2012 In "Moleskine", "Mythical Flying Trilobite Fossil", "flying trilobite", "pencil", "sketch", "steampunk"
A little sketch I did after dinner last night. Ammonite-hands are predatory creatures, I assume. Written by Glendon Mellow On October 5, 2010 In "Ammonite", "Glendon Mellow", "Moleskine", "flying trilobite", "pencil", "sketch", "surreal"
Last spring, I was contacted by Karen about a commission. Her boyfriend is Mike Haubrich of Quiche Moraine, one of my favourite bloggers and a supporter of my artwork since the beginning of this blog. I've met a lot of people so far in my blogging, but Mike and Karen are somewhere at the top of the list of people I haven't shaken hands with yet. Karen wanted to get Mike a painting of mine for his birthday this past August. I was thrilled, and honoured. Contract stuff out of the way, we discussed what sort of thing he might like. Karen loved it, and I got to work. Click to enlarge my scribbles. I liked the thumbnail sketch near the bottom, and decided not to do another looking-over-the-shoulder pose, like this one. I selected a beechwood cradleboard to paint on, 12"x18". I gessoed it black while listening to Debaser and Die Antwoord. Next, I cartooned in the image using white chalk. I find the chalk disperses nicely in the oil paint and it won't slowly rise to the surface of the paint film like graphite can after a number of years. As oil paintings age, they darken and become more transparent, so it really matters what colour your ground and drawn outlines are. Look close and you can see a bandana around his right arm, and bracelet on his right wrist. Started painting. The trilobite fossil and ammonite shell (seen below) were there for colour and texture reference and maybe as superstitiousy talismans, I suspect. Safety blanket. Or I just like looking sciencey when I post pictures of my process. You can see this is what I call the "Ugly Phase". Lots of splotchy unblended colour laid down. Originally, I planned to have spotlights on the edge of the stage, but I decided to paint over them. They competed too much with the bright circles of light. This was getting later one evening, so I was listening to Massive Attack. Still some fast beats for me to time my brushstrokes to, but mellow enough not to bother my wife while she works on the computer. Below, a partially finished head compared with the completed head. I worked and re-worked the head and spine of the trilobite body parts over and over. Still worry the front looks like a big ol' mustache from this angle. You can see there's a lot of glare in the photo on the left. Photos of wet oil paintings are tricky. What you need to do is have two light sources waaaayy out at the sides, and take the photo. Or, if you live in a small apartment, take a picture on an angle in diffuse fluorescent light, and use Photoshop to mess with the perspective afterwards. For the musicians out there, note how wrong I have the shape of the bass. I only noticed after everything was almost done. I wiped it down with tissue dabbed in solvent and re-did the area. Throughout this painting, I kept returning to the Toronto band Debaser as inspiration. My good friend Nevin is/was the guitarist, and I love the way he played. Mind you, he's never done devil horn's on stage that I can recall. When I paint, I tend to work on one element at a time, bringing it all up in detail before moving on. This is contrary to how painting is supposed to work: you really should rough-in everything then refine, going around all the elements. I like to see the figure emerging from the darkness whole: first an arm, then an eye, then the neck and back, and so on. It feels more like pulling something out of the blackness than painting a picture. I sent images of the final to Karen and waited. That can be the toughest wait of the job, seeing how the client will react. I try to keep people I'm working for in the loop throughout the process so if there's a major concern we can spot it early, but the suspense when I send that last photo or the final in the mail is still tough. Karen loved it! And importantly, thought Mike would to. She was right. Rock on Karen, and Happy Birthday Mike! Written by Glendon Mellow On September 8, 2010 In "Glendon Mellow", "Moleskine", "Trilobite Boy", "commission", "music", "oil paint", "process", "sketch", "tuibguy"
We're moving pretty soon (possibly sooner than expected!) so not a lot of time to complete self-started projects at the moment. Here's a sketch for what will be a brightly coloured painting: Trilobite Boy Saves the Day. I'm thinking bright lime green for the cape. Standing on a red brick rooftop with bright blue sky and fluffy clouds overhead. I'll probably re-pose the arms. You can click here for more Trilobite Boy sketches and artwork. I'm just getting started with this character and his cast. Don't forget to vote on my poll! Kthx. Written by Glendon Mellow On July 26, 2010 In "Artwork Mondays", "Moleskine", "Trilobite Boy", "pencil", "sketch"
A few past dinosaur skull sketches, mostly made at the Royal Ontario Museum. All done with .3mm or 2mm technical pencil in my trusty Moleskine sketchbooks. The contours and shadows are endlessly fascinating to draw. I gotta get a new ROM membership. Written by Glendon Mellow On June 14, 2010 In "Moleskine", "R.O.M. ", "dinosaur", "fossil", "gryposaurus", "parasaurolophus", "pencil", "sketch"
Since I am under more deadline pressure than usual, please enjoy this little drawing originally shown on The Flying Trilobite back in June of 2007. Lots of work is happening behind the curtains right now, just like on The Muppet Show. Only imagine Kermit trying to get some painting done while Gonzo rounds up chickens and Fozzie sets fire to the stage. Life is like that sometimes. Need more sleep. But first must draw anatomy on stretched surgical gloves. 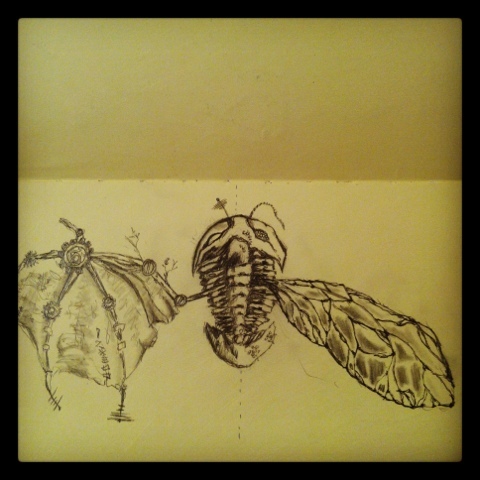 Written by Glendon Mellow On November 16, 2009 In "Artwork Mondays", "Drawing", "Moleskine", "Trilobite", "pencil", "tree"